First of all – you don’t have to be manager or in a defined leadership role to understand and benefit from this book. Whether your career has you in the corporate world, healthcare industry or you coach basketball – the concept of including emotions in our thinking processes has been completely negated by most institutions. At best we are culturally taught that emotions should be expressed in controlled ways, especially in our work environment. Most of us believe that our biggest mistakes have been the result of our reactions or non-actions at times when our emotions overwhelmed us. As a result, we default to rational thinking as the only way to think intelligently and ignore or suppress our emotions to avoid making further mistakes. To debunk the myth that emotions flaw our thinking, Dr. David Caruso and Dr. Peter Salovey use real case studies from the corporate world to work through how emotions provide important data that we can learn to access and integrate to optimize our thinking and decisions. The science behind our emotion centers of the brain suggests our emotional intelligence is central to what it means to think, reason, and to be intelligent. In The Emotionally Intelligent Manager, the authors offer diagnostic examples that show how emotions influence our ability to make decisions, solve problems, cope with change, and motivate others. The authors describe a practical skill-based model called the EI Blueprint, which details how we become aware or identify emotions, use emotions to facilitate thinking, understand emotions and their predictive nature, and manage emotions by integrating them into our thinking. 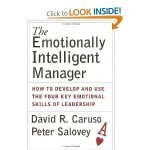 Caruso and Salovey’s book offers strategies to help develop each emotional skill so you can employ them in an intelligent way to address your relational and work-related challenges.